The dramatic slump in crude oil prices over the past year or so has cast a huge pall over the once-buoyant offshore and marine sector. Oil has plunged to below US$50 a barrel from a high of US$115 in June last year and this has caused super oil majors such as BP, Chevron and Shell to tear up their spending budgets and defer an estimated US$200 billion (S$281.2 billion) worth of projects. The impact on the offshore industry has been an immediate suspension of business as usual. Oil rig owners such as SeaDrill and Transocean have been pressured to cut the rental rates on the rigs they lease out by up to 30 per cent as oil majors trim budgets. This has caused them to defer buying new rigs and, in some cases, postpone deliveries on rigs that they had ordered. The result is a drying up of the multibillion-dollar rig orders which Singapore's two rig-builders, Keppel Corp and Sembcorp Marine, had been winning in recent years. Oil majors are also postponing the final investment decision on production plans for new offshore fields they have already explored. This puts pressure on companies specialising in seabed installations such as Ezra Holdings. Operators of offshore supply vessels (OSV) , which provide a wide range of services such as handling the anchors for oil rigs, are also feeling the pinch, as they are forced to slash their rates. As a result, their share prices have taken a beating. In the past year, both Keppel and SembMarine had fallen by about 33 per cent in value, while smaller firms such as Ezra had plunged by up to 82 per cent. But analysts fear that worse is to come as they draw an unsavoury comparison between the current downturn and the 1985 oil price slump. In a recent report, CIMB analyst Lee Siew Khee produced a chart which showed that a total of 249 jack-up rigs were ordered between 1973 and 1982, when crude oil quadrupled in price. 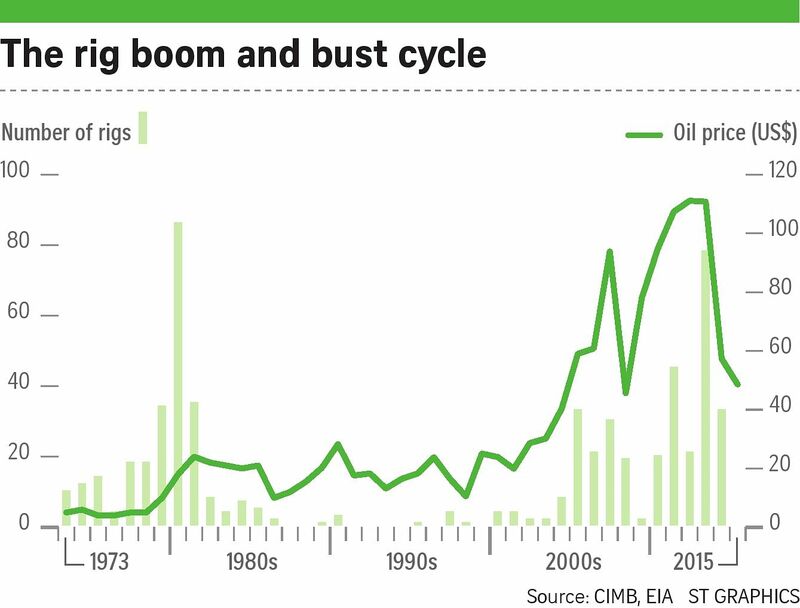 But after oil prices halved between 1984 and 1985, rig orders dried up. That trend was reversed only 10 years ago as China emerged as a major consumer of energy, raising orders of jack-up rigs to 312 between 2005 and 2014.
will repeat itself, given the uncertainty over how much further oil prices may drop and a possible overhang of new rigs and OSVs entering the market. But at a recent analysts' briefing, Mr Chow Yew Yuen, chief executive of Keppel Offshore & Marine, who described himself as "a veteran of four market cycles", noted that it is still too early to tell if the slump would be prolonged. So far this year, Keppel and its rival, SembMarine, have not clinched any rig orders. This is a big contrast from last year when Keppel raked in orders to build a total of 10 rigs, while SembMarine got orders for five. So far this year, Keppel has amassed $1.6 billion in new contracts, far less than the $5.5 billion worth of contracts it got last year and $7 billion the year before. There is a similar drought at SembMarine, whose order book this year is dominated by an estimated $1 billion order to build a semi-submersible crane vessel for Dutch firm Heerema Offshore. In contrast, the rig-builder had secured S$4.2 billion of orders last year and S$4 billion of orders in 2013. As the cost-cutting measures by oil majors bite, the buzzword is "right-sizing" as companies refocus on the basics in their business. Keppel chief executive Loh Chin Hua said: "Right-sizing is about value engineering, rather than cutting costs across the board. There are areas where we can tighten up. We are still investing in R&D, training and improving productivity." For the second quarter ended June 30, staff costs at Keppel were slashed by 17.5 per cent to $368.8 million as it trimmed items such as provisions for bonuses. But Mr Loh is optimistic that the low oil prices may give rig-owners an incentive to replace their ageing rigs, even as gloom pervades the oil industry worldwide. He said: "It is estimated that about 94 jack-ups and 27 floats around the world are more than 30 years old. The scrapping of oil rigs will hasten a rebalance of demand and supply in the offshore market." For deep-sea contractor Ezra, "right-sizing" would be a familiar buzz as the company steadied its ship with a rights issue to raise $200 million to repay debt. Mr Eugene Cheng, Ezra's group chief financial officer, said the company has a backlog of contracts worth over US$2 billion across the group - which should keep it busy over the next 18 to 24 months. While Ezra is bidding for US$7 billion to US$8 billion of new contracts in the sub-sea space alone, some delays in tender awards are possible, although it remains confident that oil majors will ultimately press ahead with the production phase of offshore fields reserves. But local brokerage UOB Kay Hian noted that while Ezra's sub- sea business is built for revenue of US$2 billion to US$3 billion a year, the company may have to downsize the scale of the operations to US$1 billion to US$1.5 billion. One challenge is to keep costs down and retain valuable staff while waiting for the good times to return. Mr Cheng said: "Sub-sea engineers are a people in demand. It is always a fine balance to ensure we have the right cost base for the anticipated work, yet be able to scale up when the demand picks up." Its competitor Oslo-listed Subsea 7 announced in May that it was shedding 2,500 jobs out of a global workforce of 13,000, and France's Technip said last month that it was slashing 6,000 jobs from its 38,000-strong workforce. In the OSV space, some ship- owners are adapting working schedules to fit the available work, since the crew get paid only if they work. "A '14 days on, 14 days off' rotation could be re-worked to 10 days on, 18 days off. The worker gets paid for fewer hours, but they are still employed and you are better prepared to respond quickly should the market pick up," Mr Joseph Bennett, the chief investor relations officer at Tidewater, which owns a fleet of 261 vessels, was quoted as saying recently. All said, weak oil prices are forcing companies in the offshore and marine industry to rethink their business strategy. Hopes abound that the slump will be only temporary. But worries about a possible long slog ahead are causing them to trim their sails and batten down the hatches.